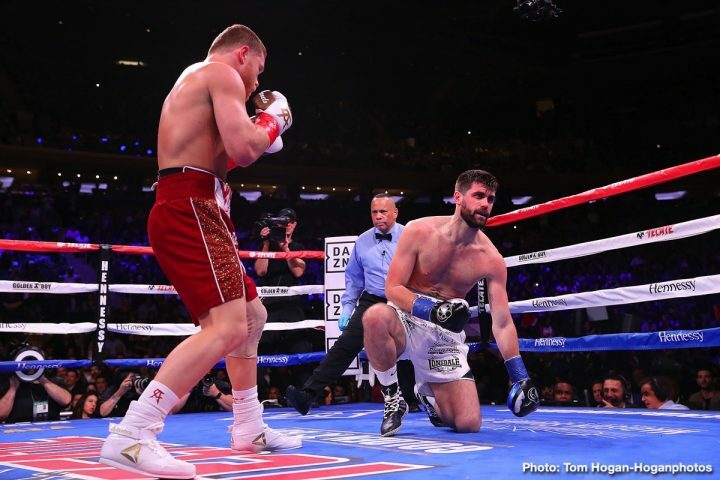 Rocky Fielding on Canelo Alvarez: "He's the best I've fought"
By Tim Royner: Rocky Fielding (27-2, 15 KOs) bestowed upon Saul Canelo Alvarez (51-1-2, 35 KOs) the honor of being the “best fighter” he’s ever fought during his career after being bludgeoned to the canvas last Saturday night in a 3rd round knockout at Madison Square Garden in New York. Although Fielding has knocked out faster than he was by Canelo in getting destroyed by Callum Smith in the 1st round in 2015, Rocky still believes that Canelo, 28, is the best fighter he’s ever tangled with during his career. You’ve got to give Fielding credit for getting up each time Canelo would knock him down. Fielding never looked hurt. The only look the 31-year-old Brit had on his face was a look of embarrassment. He was making mistakes and paying for it each time by the well-schooled Canelo. Had Fielding figured out early enough to keep from getting smacked around the ring, he might have given Canelo a real fight. Canelo’s face was swollen underneath his left eye after just the 1st round from Fielding’s shots. Canelo wasn’t even thinking about his defense. He was just looking to walk Fielding down, not caring about his shots, so that he could land his own hooks to his body. Fielding handled Canelo’s head shots fairly well in the first two rounds, but he had no ability to take his body shots. They were too painful. For a world champion, Fielding fought in an amateurish way throughout the three rounds, letting Canelo walk him down and backing up to the ropes to give away his height and reach. It was an odd choice for Fielding to abandon his outside game entirely in the opening seconds of the fight, and choose instead to fight on the inside against Canelo. For the casual observers, it appeared that Fielding wanted to get knocked out. He fought Canelo’s fight from start to finish by letting the 5’8″ Mexican star battle him in close, and the end result was a predictable one. After Fielding was knocked down in the 1st round by Canelo, it was thought that he would fight in the center of the ring to use his height and reach against Canelo. Fielding had a five inch height advantage and an equal amount in the reach department. When Fielding did fight on the outside, he was having success with his stiff jab. Why Fielding chose to abandon his jab is anyone’s guess. With his decision to fight Canelo at close range, Fielding essentially handed over his WBA ‘secondary’ super middleweight title to the 28-yer-old Golden Boy star Canelo last Saturday night. As such, it wasn’t a surprise that Alvarez blasted Fielding to the canvas four times, and stopped him in the 3rd round. Fielding’s trainer might as well have called it a day in the 1st round after the first knockdown. It would have saved Fielding the embarrassment of being knocked down an additional three times before the spectacle was stopped in the 3rd round. The fight was always thought to have one outcome with Canelo winning, but it was disappointing that Fielding didn’t give a better showing than he did. This was Fielding’s first time on the big stage in a huge fight, and he failed miserably under the lights against Canelo. The way that Fielding rolled over to Canelo, it’s unlikely that he’ll ever be back at this level. Fielding might get lucky at a later date and capture another world title, but that would be more of a product of how weak the 168 lb division is right now. The super middleweight division is weak and utterly watered own due to the numerous belts from the four sanctioning bodies that have littered the weight classes with their many titles. Canelo came into the fight as a massive favorite, and it’s clear that the odds-makers had done their homework well in evaluating Fielding’s limited talent. It wasn’t surprising that Fielding lost the fight. What was surprise was how easily he folded up under the pressure from Canelo. It was thought that Fielding would at least go out on his shield after giving a game effort. After all, he had zero pressure on him due to the entire boxing world giving him no chance of beating Alvarez. Only now does Fielding understand that he made a mistake by standing in front of Canelo for too long. Fielding’s trainer should have been reading him the riot act after the 1st round not to fight off the ropes, and to stay in the center of the ring. His trainer was clearly giving Fielding good instructions in between rounds, but he wasn’t following what he was saying. Fielding was just nodding his head, and saying, ‘Yeah.’ He seemed totally detached from what was going on. He was being routed by Canelo, but oblivious to what he needed to do to make it a competitive fight. U.S boxing fans got the chance to see Canelo vs. Fielding with a free trial on DAZN. If not for that, there would likely have been more criticism today due to Alvarez’s poor opponent, and the lack of entertainment value. The most interesting fight on the card was arguably the co-feature bout between IBF super featherweight champion Tevin Farmer and Francisco Fonseca, which was a one-sided affair, but still far more entertaining than the Canelo-Fielding fight turned out to be. Had the boxing fans needed to pay to see the Canelo vs. Fielding fight, there likely would have been a massive amount of grumbling from them today. As it is, the fans are complaining about Canelo’s poor opponent. The fans set aside time in their busy lives hoping to see an exciting fight involving Canelo, but it turned out to be a big time waster. Fielding didn’t belong inside the same ring with the Mexican star. That was apparent from the first 30 seconds of round one. Fielding looked like he stumbled into the ring from the audience, and Canelo was going to work him over as fast as possible. The win for Canelo made him a three division world champion. The boxing fans are hoping that Canelo will stay at super middleweight long enough to fight a good fighter like Callum Smith, but it’s looking already like he plans on moving back down to middleweight to fight Daniel Jacobs, who was inside the ring with him afterwards. Canelo seemed wishy-washy when asked afterwards if he’d like to fight Gennady Golovkin for a third fight on May 4. Canelo stated that he feels he showed that he’s the better fighter than him from their two fights, and that he doesn’t need to fight him. However, Canelo says it’s up to the boxing fans whether they want him to fight GGG again. If not, then Canelo says he’ll continue to fight the best. Obviously, Fielding was not the best, so Canelo will need to raise his game if he wants to truly fight the best, and not just give lip service about facing the best.